Great teachers and practitioners of homeopathy, based in the UK, share their stories, wisdom, experience and insights. A reflection over forty years of Great Britain's homeopathic history through a compilation of interviews with thirty-four of the UK's leading teachers. A reflection then, but also a reply to Vithoulkas' assertion that there were no great teachers of homeopathy at present in the UK! 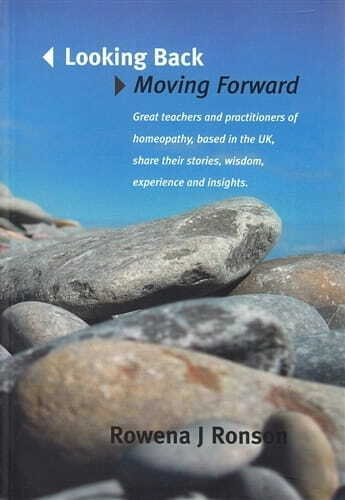 'Looking Back, Moving Forward' is an essential and unique textbook for students and practitioners of homeopathy. The book is 'Looking Back' over the last forty years at our renaissance as our great teachers and practitioners share their vast collective experience and it also asks and answers many questions about homeopathy's journey 'Moving Forward' through the 21st Century. The book traces homeopath Rowena Ronson's journey in conversation with thirty four of the UK's great teachers and practitioners of homeopathy. Conversations with . . . . . . . . . .
Linda Gwillim * Bill Rumble * Brian Kaplan * Myriam Shivadikar * Ellen Kramer * Peter Chappell * Robert Davidson * Misha Norland * Annette Gamblin * Francis Treuherz * Charles Wansbrough * Jerome Whitney * Mike Bridger * Dion Tabrett * Ernest Roberts * Gordon Sambidge * Sheilah Creasy * Kate Chatfield * Roger Savage * Subrata Kumar Banerjea * Yubraj Sharma * Kaaren Whitney * Anne Waters * Rebecca Preston * Martin Miles * Carol Wise * Linda Razzell * Nicky Pool * Lesley Gregerson * Sue Sternberg * Lionel Milgrom * Barbara Harwood * Simon Taffler * Jeremy Sherr. This book is a rich repository of British ho­meopathic history giving fascinating in­sights into the lives and philosophy of ho­meopathic healers in the UK. It provides really stimulating reading from cover to cover. A reading of this book re­minds us that there are many, many meth­ods out there that can and do work. But not everything is for everybody. A key chal­lenge is to reveal the proper way for you and your cases, with the overriding criteri­on being to help to release the patient from whatever is blocking him or her, and the release from suffering. And we must al­ways keep in mind the golden rule that we must be patient-centred and not prac­titioner-centred/egocentric. So everything that works helps, such as giving two rem­edies at once. It may be allowed and justifi­able for a particular situation. This book is made up of 32 chapters reflect­ing 40 years of fascinating opinions, perceptions and memories of the different contributions. It is like an enthralling pilgrimage through individual interviews and conversations with 34 British homeopaths. Every interview reflects an aspect of the British homeopathic scene, and shows the variety of ways in which homeopathy can be practised effectively. You can get a mea­sure of the vast collective wisdom based on daily practice and teaching. You can wit­ness the roots of the homeopathic renais­sance in the UK during the sixties (looking back), from which the future outlines of UK homeopathy clearly germinate (moving forward). Rowena Ronson, who put this book together, is a British homeopath and registered member of the Society of Homeopaths. Her practice developed in Bushey, where she offers daily homeopathic care. She also teaches at the Open University and contributes to homeopathic journals. Her website, http://www.lookingbackmovingforward.com con­tains more information about her. As for the book's strong points from my perspective, I was fascinated by the ho­meopathic branch rooted in the British druid tradition of the group taught by Thomas Maughan, who was the mysterious hermetical figure of his day. He reputedly gave everybody remedies either in a 200C or 10M potency as their first prescription. He would use 200C for bowel nosodes and detox remedies followed by a 10M poly-chrest. Even today, when you do not know what to do with your case, you can find one of his combination remedies to sort it out. All in all a really mysterious person, this Chief Druid of England: a spiritual teacher of great substance who had a strong impact on his homeopathic students. And I could continue with the likes of Yubraj Sharma (interviewed in Chapter 19), self-taught and now principal at the School of Shamanic Homeopathy in Wembley. Another striking aspect discussed was the issue of infertility in women. What is its root? It is suppression. As Linda Razzell says in Chapter 25: "Kali carbonicum is my great remedy for all fertility problems or Folliculinum followed by bowel nosode program. It is like Sulphur in obstetrics. It can undo almost any damage or interrup­tions to the female cycle." So for whom was this book written? Any reader may learn a lot about various forms and aspects of homeopathy in practice. This book should therefore be in the library of every college to bring inspiration to its students. No more needs to be said: it is enjoyable reading which can be recommended to everyone. The subtitle tells us: 'Great teachers and practitioners of homeopathy, based in the UK, share their stories, wisdom, experi­ence and insights'. Between 30 November 2004 and 5 December 2005, Rowena talked to 34 'of the UK's great teachers and prac­titioners of homeopathy' in 32 interviews, and this book is a record of these conver­sations in the order in which they took place. The book 'looks back' over the last forty years as these teachers and practi­tioners share their collective experience, and asks and answers question about how homeopathy is likely to 'move forward' through the new millennium. Here's a list of interviewees in alphabetic order, which some of us might find helpful as the information is otherwise contained in a much larger list of 'UK homeopaths, past and present' in the index: Subrata Kumar Banerjea, Mike Bridger and Dion Tabrett, Peter Chappell, Kate Chatfield, Sheilagh Creasy, Robert Davidson, Annette Gamblin, Lesley Gregerson, Linda Guillim and Bill Rumble, Barbara Harwood, Brian Kaplan, Ellen Kramer, Martin Miles, Lionel Milgrom, Misha Norland, Nicky Pool, Ernest Roberts, Rebecca Preston, Linda Razzell, Gordon Sambidge, Roger Savage, Yubraj Sharma, Jeremy Sherr, Myriam Shivadikar, Sue Sternberg, Simon Taffler, Francis Treuherz, Charles Wansbrough, Anne Waters, Jerome Whitney, Kaaren Whitney, Carol Wise. In the preface we learn that the inspi­ration for the book came when Rowena asked George Vithoulkas to name current great teachers of homeopathy. He did not include any UK-based names in his reply, because in the UK we have '... lost our way and are therefore not influencing homeopaths capable of sustaining our discipline into the future'. As Rowena had just spent a year as education adviser for the Society of Homeopaths, which had brought her in close contact with six homeopathic course providers, three of which had a non-classical ethos, rather than her own much more classical perspective, she was well-positioned to ask questions to draw out information about various different approaches. The interviews range from six pages (Lesley Gregerson and Rebecca Preston) to 22 pages (Sheilagh Creasy). Some give a fascinating insight into what brought the interviewee to the place where we knew them (Barbara Harwood, principal of CoH during my student years), and others give less away about the non-homeopathic aspects of their lives. Some are still in teaching mode - sometimes Rowena meets the interviewee in their lunch break during a teaching day - so we also get an insight into their favourite topics. (For example, Ellen Kramer's explanation and definition of practical homeopathy, or Subrata Banerjea's miasmatic approach, 'MTEK'). A lot of work has also gone into the index. There are various categories from Allopathic Medicine to Science, with Homeo­pathic Terms and Remedies, among other categories, in between. It's a fascinating read if you like this sort of thing - which I do (I researched the heroes and contemporaries of James Compton Burnett, 1840-1901, as part of my final year project). It doesn't matter if you dip into this book at whatever chapter it falls open, or if you read it from first to 32nd, or if you head for an interview with someone who particularly interests you. But be warned, the pictures of the inter­viewees are very strange. Presumably each interviewee supplied a recent photo, but it looks as if the pictures have either been stretched or shrunk to fit a standard size and, honestly, if you don't know what these people look like, please don't think you'll recognise them from here! On the downside: size, and cost. Too big to slip in your bag in case you have a few spare minutes in the day, and not easy to justify the cost at the exclusion of more erudite homeopathic tomes. However, I have enjoyed reading it, dipping into it, and revisiting it. They have also speculated about people who were not included. Did they say no, or were they unavailable in Rowena's timescale, or had they not crossed Rowena's radar?